Last week was Boy Scout Week. The Nation's heart met appeals for community service In behalf of the boys who are the citizens of tomorrow and who in this time of stress and strain need safeguarding and direction as boys have never needed it before. Following this, it is eminently fitting that the Nation's thought should be focused on a condition which menaces boys and girls and adults as well. The menace is particularly dreadful for youth, for all of life in all its years is likely to pay the price. Today is the beginning of narcotic-education week. For 9 years the World Narcotic Defense Association has rendered great service to humanity in exposing this fiendish business and in securing such worldwide interest that we are in the way to see a glimmer of hope in the sky, which not long ago did seem so dark. It is passing strange, is it not, that we need to be told more than once about the horror of drug addiction and the extent to which it grips people everywhere? We greet you, Admiral Richmond Pearson Hobson, hero of the Merrimac, honored Member of Congress for many years, but now rendering possibly your best service to your country as president of the World Narcotic Defense Association. God speed your work and bless you in it. Fifty-two nations of the world have ratified the narcotic convention, which limits the manufacture and distribution of narcotic drugs to the requirements of science and medicine; among these we stand second in our ratification. But alas, this law, like many others, all others, is violated. Liquor was smuggled into the country, and now is between the States. Smuggling of drugs is easy because of the small space needed. For several years the worst victim nations of the illicit traffic in narcotic drugs were Egypt, the United States of America, and China. A few years ago, when I was in Egypt, those engaged in the traffic were also engaged in a strong effort to secure the removal of Russell Pasha, chief of police of Cairo, because he was reducing their contraband trade to a remarkable extent. HIS success has continued, but the United States and China still remain outstanding victims of this nefarious traffic. Practically no drugs manufactured in the United States of America have entered the illicit traffic of either this or other countries. On the other hand, most of the illegally sold narcotics here were made elsewhere and smuggled in. The problem, therefore, is International whether considered from the national or from the international viewpoint. In recent raids the chief drug seized was heroin, called the Most deadly of narcotics. The main source of supply is the Far East and Bulgaria, and the "dope" seized was traced to French and Chinese ports of shipment. The morphine was found to come from Japan, China, and Honduras. In the last-named country alone, it is estimated, the morphine importations of the last 18 months would suffice for its legitimate needs for the next century, but most of this supply was intended for the contraband trade here. The cocaine was of Swiss, French, and British origin; smuggled In from Honduras, Mexico, and China, respectively. A most alarming situation has developed In Bulgaria where at least 10 factories and laboratories producing illicit heroin, the worst of all narcotic drugs, have been located. Experts estimate that, during 1 year, enough heroin has been produced in Bulgaria to supply the total legitimate needs of the entire world for at least 4 years. In the Far East, notably in China and Manchukuo, narcotic conditions have become so grave as to constitute a serious menace not only to China but also to the rest of the world. It is estimated that China produces annually 7 times as much as all the rest of the world together; also that 30 percent of the population of Manchuria are drug addicts. Not only is addiction to opium increasing, but the use of heroin and morphine appears to be ravishing the people of those countries. Evidence indicates that the clandestine manufacture of heroin and morphine is making rapid headway, and there is every reason to believe that quantities of those drugs are being smuggled into the United States and her colonies. Why is the United States of America one of the outstanding drug Victims of the world? 1. Because some nations do not effectively restrict their narcotic products to medical and scientific requirements, thus allowing large quantities to leak into the illicit traffic, whence they are smuggled into America. 2. Because many of our States neither have strong, uniform narcotic laws, nor efficient enforcement, and do not cooperate sufficiently with our Federal enforcement officers. 3. Because, with the exception of California and a few other States, the segregation and rehabilitation of drug addicts has been Badly neglected. 4. Because our youth In so many educational Institutions have not been intelligently instructed concerning the narcotic problem. 5. Because among the public at large there has been a shameful ignorance and indifference toward the narcotic menace. 6. Because there is enormous wealth In the United States, and the illicit drug traffic has marked America as a most fertile field for its ignoble profits. In the illicit traffic many drugs sell for over 12 times as much as on legal medical prescription. 7. Because the boundaries of our Nation, extending over 10,000 miles are so immense that our Federal Narcotics Bureau finds it difficult to prevent smuggling across such vast border areas. 8. Because of the highly organized criminal gangs and the great crime wave in the United States. Listening friends, have you an adequate idea of just what this situation implies? 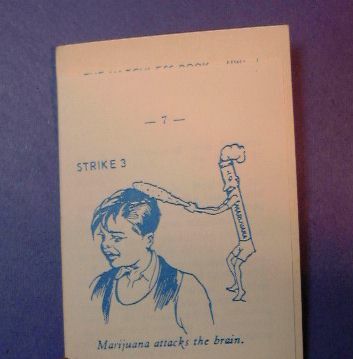 Have you accurate knowledge of the dope menace to the life and health of the Nation? �Dope User, 15, Tries to Kill", "Dope Peddled to High-School Students�, �Paregoric, Marihuana, and Death Impulse�, "Doped Cigarette Puts Hundreds in Drug Tolls" have been some of the headlines greeting readers of daily papers during the Nation-wide drive of Federal authorities against the Illicit drug traffic. "Informed that peddlers of marihuana, held by crime lighters to be as vicious as narcotics or opiates, are making their head-quarters near high schools, Superintendent of Schools Bogan ordered his district superintendents to launch an investigation and submit reports. Lt. William Cusack, head of the narcotic squad, revealed the marihuana weed is being grown domestically---plots of ground being devoted to it within a few miles of Chicago. * * * * He has sent 197 peddlers of it to jail, deported 50 persons to Mexico for selling the weed, seized 167 pounds of marihuana and 183,000 cigarettes within the past year." Marihuana is a derivative from a variety of hemp. In the desert section of the West where it is indigenous it is called "loco weed." It is rolled in cigarettes which sell from 25 cents to a dollar. It produces an effect similar to Turkish hashish. It creates delusions of grandeur and breaks down the will power and makes the addict ready for any crime, even murder. The last stage is a depression during which suicide is often contemplated or even accomplished. "Investigation of the sale of drugs to school children In the M. school district was ordered last night after a boy of 15 had attacked his father, a music teacher, with a knife while crazed with marihuana cigarettes. Only the father's quick action in wresting the weapon from the youth saved the parent from death or serious injury. After hearing the boy's story the officers arrested the owner of the school store and the clerk from whom the boy said he bought the cigarettes." Another account is that of a lad of 19 who "had been brought to the verge of suicide by drugs", and who led the narcotic squad in raiding an apartment: "The young victim said he was driven to desperation by marihuana cigarettes he had smoked there. * * * and had tried to plunge Into the river." Prevented by passersby, he was taken to the boys' court, where "he confessed he had spent many nights in the apartments where, he said, the drug was sold to boys and girls who were allowed to sleep off the effect. He had been a choir boy when he fell Into the clutches of a paregoric peddler. * * * He grasped at the chance to take a 3 months' cure at the Bridewell." Within a few days during a Nation-wide Federal drive last December more than 800 peddlers and narcotic denizens of the underworld were arrested. One of the peddlers confessed that he had been selling dope at the rate of $1,300,000 a year and that many women and girls came to his apartment for their daily dope jamboree. In many cities leaders of rings have been seized who were not content with supplying addicts with drugs, but plotted to ensnare large groups of new victims by giving boys and girls free samples. It Is estimated by Federal experts that 80 percent of drug addicts become criminals, for they will lie, steal, or commit any crime to get the money to satisfy their terrible appetite for drugs. A large portion of the Inmates of Federal penitentiaries are either drug addicts or were convicted for violation of narcotic laws. What can be done to aid in this crisis? An important matter to which all citizens should give their attention is the passage of the Uniform Narcotic Drug Act by the State legislatures. The Federal Narcotic Bureau exercises control over manufacture, importations, and interstate traffic in drugs. But the Federal Government cannot revoke the State license of a physician or dentist or druggist who violates the law. He may be convicted and serve a Federal sentence and return to his practice in his State. The cooperation of the United States in the International conference is incomplete till all States have passed such a law. Only nine States have done so. Will not every hearer today in the other States write to the Senator and Representative of his district and urge their interest in the enactment of the Uniform Narcotic Drug Act? There must be narcotic hospitals for the segregation and rehabilitation of these unfortunate people, for their own sakes and for the protection of society. (page 4426) Finally, youth and the public at large must be educated that they may not acquire the drug habit and they may all join In the struggle to free their own and other countries from the narcotic drugs, alcohol, opium, heroin, marihuana, and any others which destroy the body and mentality of the individual and thus lower the standard of our Nation.